Geriatric Practice Management, Corp., GEHRIMED has achieved Office of the National Coordinator for Health Information Technology (ONC-Health IT) 2015 Edition Health IT Module Certification via Drummond Group LLC, an Authorized Certification Body (ACB) that has been empowered to test software for compliance with the requirements of the federal government’s program. The stamp of approval designates that the software offers the functionality that enables eligible providers and hospitals to meet the requirements of various regulatory programs that require use of certified EHR technology. “Certification is incredibly important to us as an EHR vendor! Once you pass the testing, your product joins the ranks of all other Certified Technology providers. That reality makes the testing process challenging for software developers responsible for certification– they are participating in a very important procedure, the significance of which is lost with our customers. The Drummond Group seems to recognize the tensions that dynamic can create, and organizes their procedures to simplify a complicated testing regimen,” Rod Baird, President, Geriatric Practice Management, Corp.
To earn the certification, GEHRIMED was tested to be in accordance with applicable standards and certification criteria put forth by the Department of Health and Human Services (HHS). GEHRIMED, which met the requirements for the 2015 Health IT Module is the mobile EHR platform built specifically for — and by — long-term/post-acute care (LTPAC) practitioners. 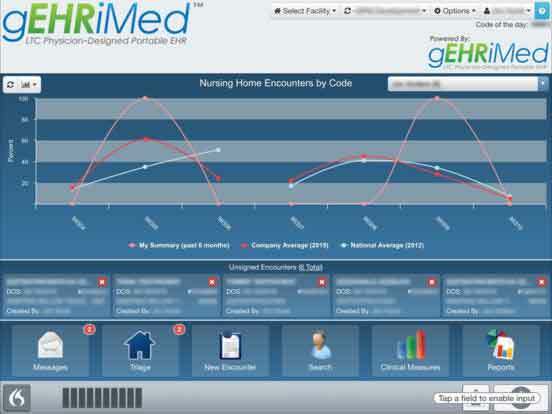 ONC-certified GEHRIMED was developed by leaders in long-term care who recognized that other EHR systems contain unnecessary features and require complicated workarounds. GEHRIMED’s features streamline data entry so practitioners can focus on providing care, not chasing paperwork or struggling with technology. This Health IT Module is 2015 Edition compliant and has been certified by an ONC-ACB in accordance with the applicable certification criteria adopted by the Secretary of Health and Human Services. This certification does not represent an endorsement by the U.S. Department of Health and Human Services. Geriatric Practice Management, Corp. (GPM) is a software solution and services company devoted to the support of the long-term/post-acute care (LTPAC) community. A focus on solving LTPAC’s unique problems has made GPM the market’s leading provider of medical EHR solutions, with the GEHRIMED EHR as the flagship product. GPM believes in the potential of powerful, intuitive technological solutions to make LTPAC professionals jobs easier, more profitable, and more effective. Drummond Group LLC is a global software test and certification lab that serves a wide range of vertical industries. In healthcare, Drummond Group tests and certifies Controlled Substance Ordering Systems (CSOS), Electronic Prescription of Controlled Substances (EPCS) software and processes, and Electronic Health Records (EHRs) – designating the trusted test lab as the only third-party certifier of all three initiatives designed to move the industry toward a digital future. Drummond Group was founded in 1999, and is an ONC-Accredited Certification Body (ACB) and an Authorized Test Lab (ATL). Drummond Group continues to build on its deep experience and expertise to deliver reliable and cost-effective services. For more information, please visit http://www.drummondgroup.com.